Fleet Surveillance Support Command was established in July 1987 to operate the Navy's Relocatable Over-the-Horizon Radar (ROTHR) in support of Fleet units worldwide. This unique radar system was originally designed to provide tactical warning to battle group commanders of air and surface threats at an extended range allowing time for responsive engagement. 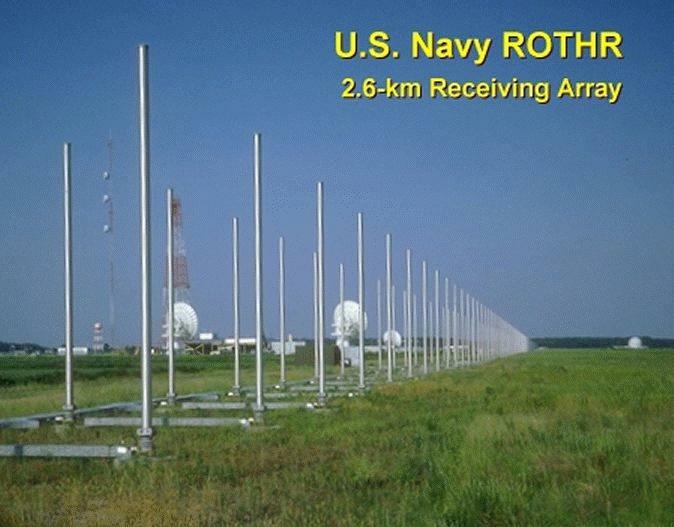 Two US Navy high-frequency (HF) over-the-horizon (OTH) radars known as ROTHR (Relocatable Over-the-Horizon Radar) are operated at Corpus Christi TX and Chesapeake VA, with coverage of the Caribbean Sea and portions of the Atlantic Ocean and the Gulf of Mexico. The ROTHRs in Virginia and Texas are presently in full-time use for counter-narcotics surveillance, and a third is scheduled for installation in Puerto Rico in the near future. A prototype ROTHR system was installed on the isolated Aleutian Island of Amchitka, Alaska, where it surveilled the eastern coast of Russia 24 hours a day, seven days a week from April 1991 to March 1993.Amchitka ROTHR U.S. Navy Base provided essential base support services for the 235-person Navy station at Amchitka Island, 1,400 miles southwest of Anchorage in the Aleutian Chain, from December 1988, until the base's closure in 1993. The system on Amchitka was dismantled at the end of the Cold War, but the first production system was installed in Chesapeake, Va., and declared operational in April 1993 in a counter-drug role in support of U.S. Atlantic Command. 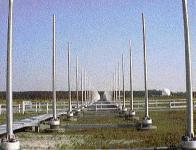 A second system was installed in Texas and became operational in July 1995. The FSSC team of officers, enlisted, civilian and contractor personnel operate and support ROTHR from Naval Security Group Activity, Northwest in Chesapeake, where the Operations Control Center and the Receiver Site are located. The ROTHR Virginia surveillance area covers more than 2.2 million square miles of the Caribbean extending north-south from southern Florida to the northern coast of South America and east-west from the western coast of Central America to the Lesser Antilles. This coverage is achieved using 5-to-28-MHz radio waves that reflect from the ionosphere. ROTHR is a land-based, high-frequency (HF) radar which can cover a 64-degree wedge-shaped area at ranges of 500 to 1,600 nautical miles. 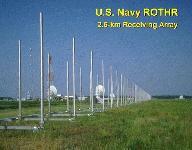 This extended range is achieved when transmitted HF energy is refracted by the ionosphere onto distant targets. The faint energy reflected back from these targets (backscatter) is detected by the radar receive antenna after returning along the refraction path. The surface of the earth and the targets in the area of interest reflect some of this energy back through the ionosphere to a separate receive site, where it is processed to generate target track information. The High Frequency Band (3 to 30 MHz) is a candidate for radar because it enables surface to surface radar to target distances well beyond the horizon. Radar to target ranges of 1000 nmi and more are typical. 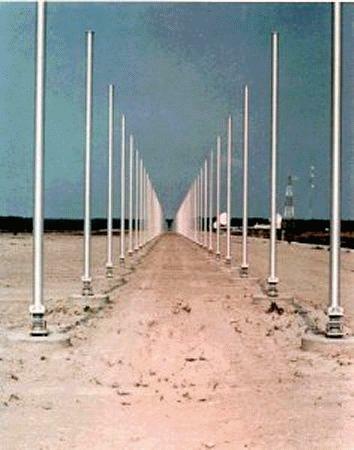 Use of the 10 to 60 meter wavelengths associated with HF radar requires physically large antennas. Each ROTHR achieves a nominal half degree azimuth angular resolution with a 2.58-km-long linear phased receiving array consisting of 372 twin-monopole elements. Each monopole pair has a receiver and analog-to-digital converter attached to it. 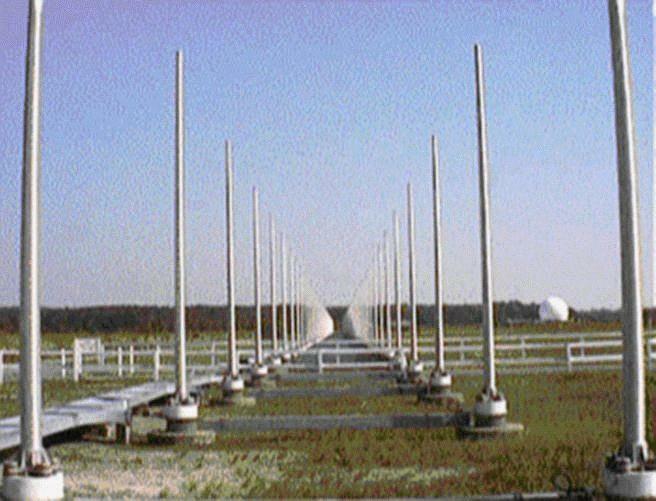 A digital beamformer forms 18 beams which are then Doppler processed to separate the moving targets from the ground clutter. Range resolution is achieved by transmitting a 25-kHz continuous frequency-modulated waveform. A radar resolution cell on the ocean surface is therefore about 6 km in range by about 15 km in azimuth, for the frequency and range used. 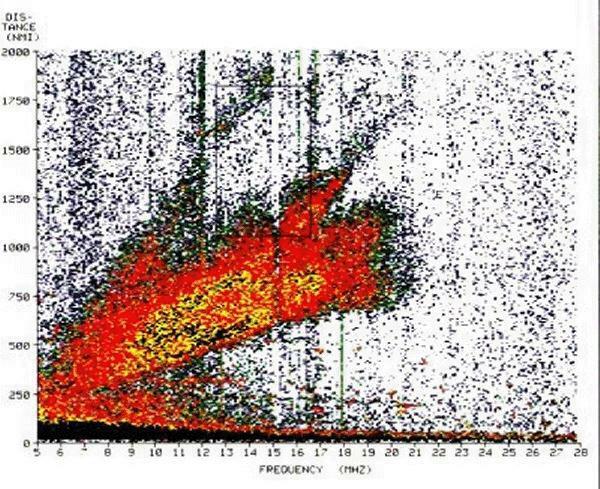 Radar frequency is variable and is selected using real-time sweep frequency ionospheric soundings. The propagation path is by ionospheric refraction which provides a "mirror" but with considerable variability. This variability is not predictable on a short-term basis; in addition, target illumination is generally by multiple paths. Tracking information thus has varying degrees of accuracy due to the changes and uncertainties of the ionosphere caused by factors such as the time of day, season, sun spot number, and other solar activity. HF radar must measure and adapt to the environment in real time, and oblique backscatter soundings are routinely taken. Because the existing Over-the-Horizon Radar Systems were originally designed to perform a military mission and not a counterdrug mission, enhancements to provide a better capability to provide surveillance are being developed by the DoD Counterdrug Technology Development Program. A series of adaptive waveforms have been developed to deal with the problem of Spread Doppler Clutter and its impact on Relocatable Over-the-Horizon Radar (ROTHR) systems for the ARPA sponsored Counterdrug Surveillance and Interdiction Program. The class of waveforms developed and demonstrated are non-recurrent waveforms with quadratic phase coding (NRWF/QPC). The waveforms were tested at Rome Laboratory sites in Ava (transmit) and Verona (receive) looking south into the Caribbean. During periods of SDC, where targets detections would not be possible, the use of the new waveforms shifted the SDC out of the area of interest to allow target detections.